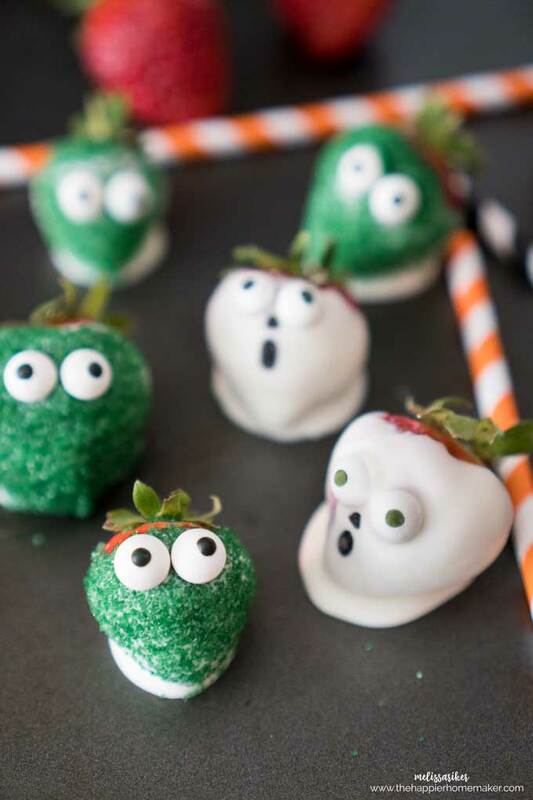 This is one of those blog posts I didn’t plan-I saw these gorgeous Chocolate Strawberry Ghosts from Yummy Healthy Easy when I was on Pinterest the other day and I knew my three boys would love them. 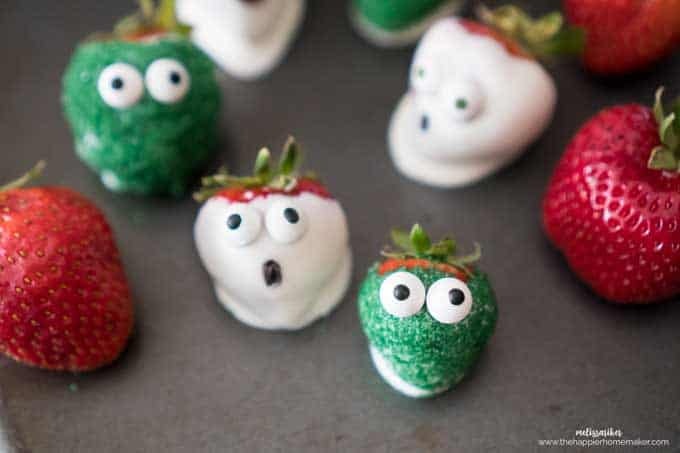 I already had everything I needed-strawberries, melting chocolate, and candy eyeballs (leftover from these Rice Krispie Treat Monsters and these Halloween Rice Krispie Monsters) so I got to work making them as a little after school surprise. As I started to dip berries they were looking nowhere as cute as I had hoped so I switched gears a little bit and decided instead of ghosts I should make zombies, and here we ended up! I raided my sprinkles and found green sprinkling sugar as well as my edible pen to add a little mouth to the zombie’s face. I was so tickled as I worked on them-I knew they would make my kid’s day when they saw them! To make the “zombies” line a baking sheet with wax paper. Melt the dipping chocolate in a bowl according to package instructions. Dip strawberries in chocolate, tap off excess and then place on prepared baking sheet. Add eyeballs while the chocolate is still warm. 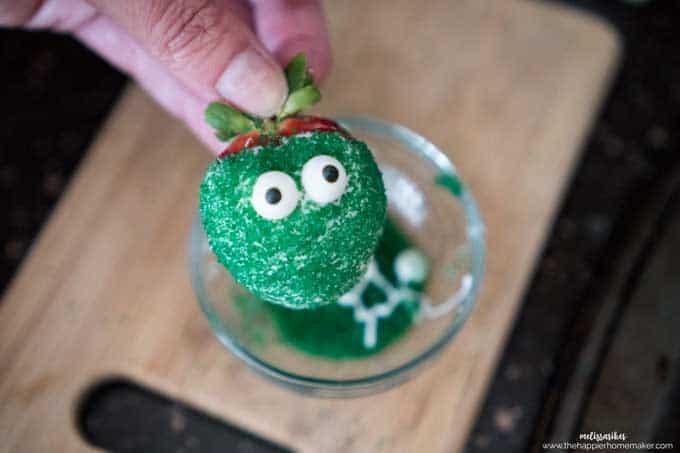 For the green sprinkled berries I held the berry after dipping over a bowl and sprinkled with the sugar. The bowl caught any excess sprinkles. Then I tapped the eyes into the chocolate and set on the baking sheet. Allow the chocolate to thoroughly harden before adding the mouth and/or nose with the pen. Aren’t they cutie-patootie?? I can’t decide if I liked them better with or without their little noses. What do you think? Let me know in the comments! These are SOOOO cute! 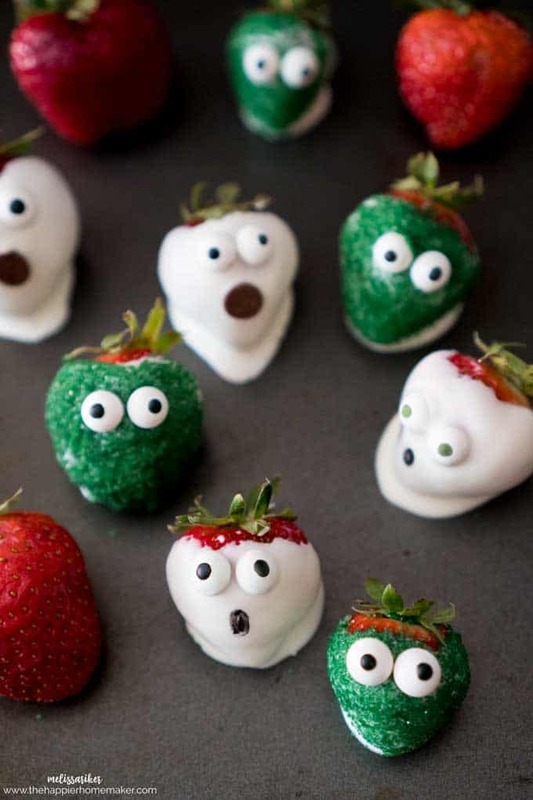 What a spooky twist on classic dipped strawberries!